"As for Asher, his food shall be rich, and he shall yield royal dainties." oil. Your locks shall be iron and bronze, and according to your days so shall your leisurely walk be." Click on the link to jump to that section of this page. The tribe of Asher received their portion from Joshua. Joshua apportioned the Asherites land, as well as that of Benjamin, Simeon, Zebulun, Issachar, Naphtali, and Dan, after the battle at the Waters of Merom. This was the third and final distribution of land by Joshua. The tribes had gathered at the sanctuary at Shiloh to await their inheritance. The tribe of Asher received the fifth lot. The borders of Asher's territory are hard to define with any certainty. Many of the towns mentioned north of Carmel have yet to be identified. Critics claim that Asher may have occupied scattered settlements within it's inheritance, yet no significant tribal settlement occurred. This, of course, cannot be verified with fact, though critics will claim there is no archaeological evidence to support the tribe of Asher as occupying this land. In the north, their land merged with the southern portion of the Phoenician Empire. It was a fertile land, especially in the interior of Lower Galilee. However, the land was dissected by roadways. These roadways were used by invading foreign armies, thus placing the tribe of Asher in the line of fire. The first mention of the geography of Asher is found in Joshua 17:7. "And the border of Manasseh ran from Asher to Michmethath which was east of Shechem; then the border went southward to the inhabitants of En-tappuah." The borders of the tribe of Manasseh are being described in the above verse. From this, we can gleam that the tribe of Asher bordered the tribe of Manasseh. 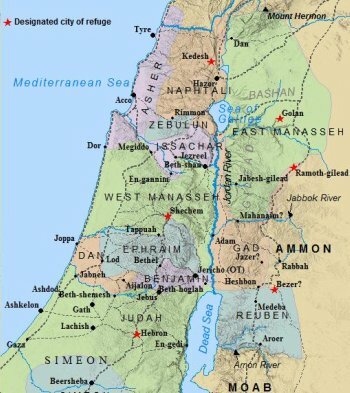 Manasseh's territory would become the heartland of the Northern Kingdom of Israel. Asher's territory was to the north of Manasseh. Another mention of the tribe of Asher is found in Joshua 17:11. Asher is mentioned in conjunction with Issachar, as these two tribes bordered each other as well. "And in Issachar and in Asher, Manasseh had Beth-shan and its towns and Ibleam and its towns, and the inhabitants of En-dor and its towns, and the inhabitants of Taanach and its towns, and the inhabitants of Megiddo and its towns, the third is Napheth." From this passage it can be gathered that Asher occupied land in the northwest part of Canaan. Their inheritance bordered the Mediterranean Sea to the west. In the Song of Deborah found in Judges 5, Asher was one of only two tribes, the other being Dan , associated with the sea and seafaring. This was unique to these two tribes, as the remainder of the tribes of Israel centered around pastoral life. Asher's inheritance can be found in Joshua 19:24-31. The first cities mentioned describe the eastern portion of the tribe's allotment. "Now the fifth lot fell to the tribe of the sons of Asher according to their families. And their territory was Helkath and Hali and Beten and Achshaph, and Allammelech and Amad and Mishal; and it reached to Carmel on the west and to Shihor- libnath." The city list of Asher begins with Helkath, located in the southeastern quadrant of the territory. Helkath rested in the ever important Jezreel Valley, near Megiddo. During the time of the Judges, the Israelites fought against the Canaanite king Jabin and his commander Sisera (Jdgs 4). Sisera's forces were stationed near Helkath, and the Canaanite forces gathered for battle against Deborah and Barak in Megiddo. The battle itself took place near Mt. Tabor. Helkath bordered the tribe of Zebulun. Along with Helkath, Scripture lists the cities of Hali, Beten, Achshaph, Allammelech, Amad and Mishal as belonging to the tribe of Asher. These cities, when viewed on a map, delineate the eastern border of Asher. This border was shared by the Israelite tribes of Zebulun in the south, and Naphtali , stretching along the remainder of the eastern border north of Zebulun. Verse twenty-seven lists other cities of Asher. "And it turned toward the east to Beth-dagon, and reached to Zebulun, and to the valley of Iphtahel northward to Beth-emek and Neiel; then it proceeded on north to Cabul,"
At first glance this verse may seem problematic. Beth-dagon was a Philistine city, dedicated to the Philistine god Dagon, and allotted to the tribe of Judah. The Jewish Encyclopedia makes mention of a city named by Sennacherib as Bit-daganna. A third Beth-Dagon is mentioned in connection with Asher. This city was southeast of Acre, near the border of Zebulun. Sefi Ben-Yosef, in Madrich Yisrael, associated this city with Beit Jann. In this context, the border description makes perfect sense, and describes it running east from Beth-Dagon to the border of Zebulun. From this point the border then turned north to the valley of Iphta-el. This valley was just to the north of the Jezreel Valley, and extended into the territory of Zebulun as well. Beth-emek is located northwest of the Iphta-el Valley. It was situated at the base of the western hills of Galilee in Lower Galilee. Cabul was located right on the border of Asher and Naphtali. The city list continues through verse 30. "and Ebron and Rehob and Hammon and Kanah, as far as Great Sidon. And the border turned to Ramah, adn to the fortified city of Tyre then the border turned to Hosah, and it ended at the sea by the region of Achzib. Included were also Ummah, and Aphek and Rehob; twenty-two cities with their villages." The description of the tribe of Asher's northern border has drawn attention from critical scholars. Certain scholars, fueled by the German scholar Martin Noth, have argued that the phrases, "unto Great Sidon" and "and to the fortress city of Tyre", were inserted into an original document, thus altering this passage of Joshua from its earliest and original version. They argue the "original" northern borders of Asher may not have been as the Bible records. Following this line of thought, thus, the border of Asher in the north is uncertain. Nadav Na'aman refutes such notions as being founded upon "obsolete" ideas and theories regarding the earliest compositions of the border and city lists. The arguments of authorship and date of writing are neither here nor there for the present purpose. 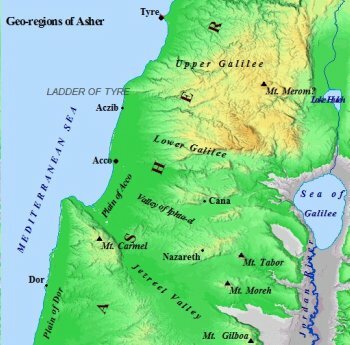 The important aspect of Na'aman's argument, found in his essay entitled "Tiglath-pilesar III's Campaigns Against Tyre and Israel (734-732 BCE)", is that he asserts the northern border of the tribe of Asher can indeed "be delineated accurately". Na'aman believes the two phrases to be "integral" parts of the border description, and can be positively identified. Many Biblical scholars have been stumped over the identification of "the fortified city of Tyre". No such city is mentioned again in the Scriptures. Na'aman claims the city can be identified as Mahalab, or Mahalliba. Mahalab is mentioned in an Assyrian inscription of Tiglath-pileser's as "his (i.e., Hiram's) fortified city". Hiram, of course, was the King of Tyre. The city is called Mahalliba in the Annals of Sennacherib. Na'aman points out the Akkadian word, al dannuti, and the Hebrew, ir mibsar, both translate as "fortified city". In this context, all sources seem to point to Mahalab as the Biblical "fortified city of Tyre". Mahalab as a fortified city would certainly be appropriate for its strategic location. The city was located near the mouth of where the Litanni river met the Mediterranean. It would have served as a vital outpost between Tyre and Sidon. It also confirms the Biblical account describing the borders of the tribe of Asher as extending to the far north into Phoenicia, thus merging with the southern portion of the Phoenician empire. From "the fortified city of Tyre" the border of Asher turned due south. Scripture lists a city by the name of Hosah, which lie to the south of Mahalab. Na'aman states Hosah "must be sought east of the city of Ushu (Old Tyre), today Tell er-Rashidiyeh". Thus, Tyre was not included in the city list of Asher. Joshua 21 mentions that the sons of Gershon received thirteen cities from the tribe of Asher, as well as those of Issachar, Naphtali, and the half-tribe of Manasseh east of the Jordan. The Levitical cities from the tribe of Asher are mentioned by name in I Chronicles 6:74-75. "and from the tribe of Asher: Mashal with its pasture lands, Abdon with its pasture lands; Hukok with its pasture lands, and Rehob with its pasture lands." 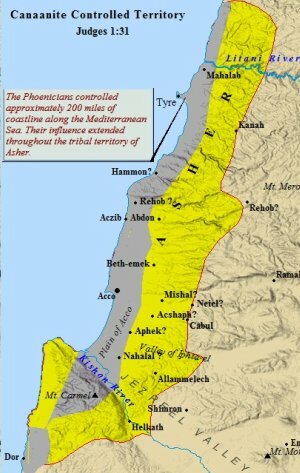 Asher's western border would have left a small lot of land for Tyre, which would have ruled independently of Israel as part of the Phoenician empire. It is evident that Tyre was a powerful city, and the Phoenicians a powerful empire. This fact is supported by Judges 1:31-32. "Asher did not drive out the inhabitants of Acco, or the inhabitants of Sidon, or of Ahlab, or of Achzib, or of Helbah, or of Aphik, or of Rehob. so the Asherites lived among the Caanites, the inhabitants of the land; for they did not drive them out." Seven cities are said to have remained under Canaanite control. These cities stretch from Acco, in the Plain of Acco, northward. 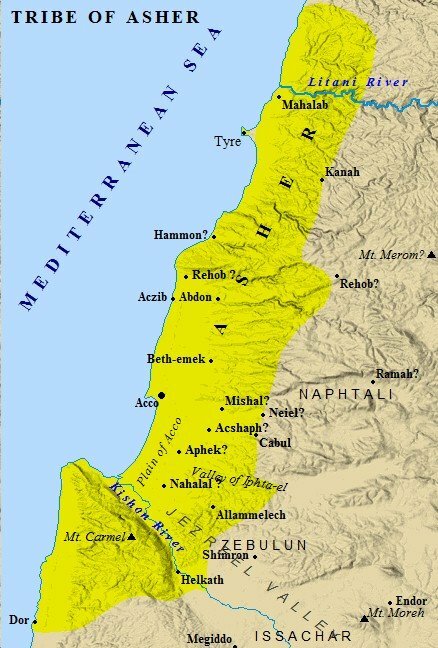 Tyre, the city of Hiram, was located just to the north of Rehob. The fortress of Mahalab and Sidon lay further north. J. McKee Adams states in his book, Biblical Backgrounds, that evidence exists which may suggest the Phoenicians controlled the city of Dor as well, located south of Mt. Carmel. The Phoenician empire, thus, stretched approximately two hundred miles along the Mediterranean. The tribe of Asher, consequently, was limited in settlement to those cities further inland. Indeed, the Israelites struggled to control the Plain of Acco throughout its history. The Philistines controlled the coastal areas in the south. Thus, with Philistine and Phoenician control of the coastal strip of Canaan, the Israelites occupied the highlands, and the settlements on the slopes of the western mountains and hills which merged with the coastal strip. The expansion of Philistine and Canaanite settlements along the coast, and Israelite settlements descending from the interior highlands, created numerous conflicts between the Israelites and their Canaanite neighbors. Despite the presence of such foreign threats, the land belonging to the tribe of Asher was some of the most fertile in the region. Jacob foresaw the prosperity of the Asherites because of the richness of their land in his blessing. He prophecied Asher's food "shall be rich", and he shall "yield royal dainties". Moses makes reference to oil in his blessing of Asher. He stated; "may he dip his foot in oil". The land of Asher was known for its olive orchards. Asher produced such large amounts of oil that it became exceedingly wealthy. A big reason for Asher's wealth, coupled with its natural production of olive oil, was its proximity to the markets of Phoenicia. The tribe of Asher became a leader in the olive oil trade in Canaan. Rabbinical Literature, as pointed out by the Jewish Encyclopedia, supports this notion. It is believed that in times of scarcity and during the Rabbinical year, Asher supplied all of Israel with oil. It was this wealth, however, which many scholars feel attributed to its aloofness. The tribe of Asher received their instructions in Numbers 2:27-28. Asher found themselves encamped under the leadership of the tribe of Dan. "And those who camp next to him shall be the tribe of Asher, and the leader of the sons of Asher: Pagiel the son of Ochran, and his army, even their numbered men, 41,500." The Asherites encamped next to the tribe of Dan, on the north side of the Tabernacle. Included in their camp was the tribe of Naphtali. All together, the camp of Dan included the tribes of Dan, Asher, and Naphtali. The total number of fighting men in this camp was 603,550. Together these three tribes secured the rear of Israel as they marched. The rear guard was, perhaps, the most critical position. These three tribes were responsible for ensuring the tribes of Israel were not surprise attacked from the rear. As they marched, the tribes would have been vulnerable to attack. The fiercest of warriors, and toughest of warriors, were primarily placed in the rear guard, in order to prevent a devastating rear attack. "Then the standard of the camp of the sons of Dan, according to their armies, which formed the rear guard for all the camps, set out, with Ahiezer the son of Ammishaddai over its army, and Pagiel the son of Ochran over the tribal army of Asher; and Ahira the son of Enan over the tribal army of Naphtali." These tribes, thus, were the last to break camp, and likely the last to pitch camp. They were exposed during the march, and depended upon to prevent surprise attack. The birth of Jacob's eighth son is recorded in Genesis 30:12-13. "And Leah's maid Zilpah bore Jacob a second son. Then Leah said, 'Happy am I! For women will call me happy.' So she named him Asher." Asher was born to Zilpah, Leah's maid. Previously, in verse 9, Scripture records that Leah had stopped bearing children. No reason is given, and any such attempt is pure speculation. What is stated is that she gave Zilpah to Jacob, and they bore a son named Gad. Immediately following Gad's birth is the birth of Asher. The implication seems to be Gad and Asher were born rather close apart, with Gad being the older. It is likely, thus, these two were close, though no evidence of such is given in Scripture. In fact, Scripture is silent as to the actions of Asher. However, he may be implied as being involved in an incident with Joseph. Asher's name, like that of his brother Gad, is akin to happiness. Other interpretations of his name have rendered it as; prosperous, blessed, honest. Critical scholars are divided as to whether the name is even an Israelite name in origin. Like Gad, which is associated with a Canaanite god of fortune and luck, Asher echoes the name of the god Asshur, the great god of Assyria, from whom the country derived its name. The Jewish Encyclopedia makes mention of W. Max Mueller's book, Asien und Europa, in which Mueller points out ancient Egyptian literature which speak of the Aseru. The Aseru were a group of people living in western Galilee during the 14th century BC. Critical scholars will point to this as evidence of a pre-Israelite settlement, from which the tribe of Asher derived their name. However, these scholars cannot rule out the possibility this settlement existed prior to the sojourn to Egypt. A theoretical scenario could have placed Asher and his family in this region before Jacob's family left for Egypt. Many Biblical scholars agree that a remnant of Hebrews may not have made the migration into Egypt with Jacob. Perhaps these people stayed behind and maintained the settlement up until the time of the Conquest centuries later. Critics are quick to dismiss such notions, even though there is no concrete evidence to prove or disprove it. A comprehensive list of Asher's family and descendants can be found in I Chronicles 7:30-40. The list focuses primarily on the family of Heber. Heber was a grandson to Asher, through Beriah, one of the sons of Asher mentioned in Genesis, and again in I Chr. 7. This list traces Asher's descendants through three generations. Verse forty concludes the genealogical record of the family of Asher. "All these men were the sons of Asher, heads of the father's houses, choice and mighty men of valor, heads of the princes. And the number of them enrolled by genealogy for service in war was 26,000 men." The renown Talmudic scholar Marcus Jastrow made an interesting connection between Asher's family and that of ancient Egyptian inscriptions. Jastrow proposed that the Heber clan of Asher was the same as the Chaberi found in the Amarna Letters , sent to the Egyptian Pharoah from local Canaanite rulers around the fourteenth century BC. In these letters, another people going by the name of the Milkili are mentioned alongside the Chaberi. Jastrow suggested these people were connected to Malchiel. I Chronicles 7:31 lists Malchiel as the brother of Heber. Interestingly, the Chaberi were synonymous with the Habiru in these ancient letters. Many now feel that the Chaberi, or Habiru, were in fact appellations for the Hebrews in general, not just the Asherite clan of Heber. The Habiru were a mysterious people from ancient sources who were depicted as migrants. In the Amarna Letters they are seen waging war in Canaan, wreaking havoc all throughout the land of Palestine. They have been named in numerous ancient sources from a wide variety of cultures all over the ancient Near East. Asher, along with the other sons of Zilpah and Bilhah, may have been involved in a negative incident in Genesis 37. This passage, however, is very vague and few details are given. The involvement of Asher is gleamed from contextual evidence. The evidence is found in verse 2. Scripture plainly states that Joseph was tending the flocks with "the sons of Bilhah and the sons of Zilpah". This would have included Dan, Naphtali, Gad and Asher. The remaining brothers from Leah and Rachel, Reuben , Simeon, Levi, Judah, Issachar and Zebulun, by implication, seem to be absent. Benjamin had not yet been born. Asher, by implication, would have been involved in this incident. He would have naturally built up resentment and bitterness towards Jospeh for his bad report. Nobody, after all, likes a tattle-tale. Joseph, however, felt impelled to tell his father. This may indicate some serious infraction or transgression on the part of his brothers. Genesis 42 mentions another incident in which Asher would have been involved, though not mentioned specifically. A famine had come down hard on Canaan. The residents of Canaan were going to Egypt in order to purchase grain from the royal granaries. Jacob, seemingly, had held out for as long as possible. However, the trip to Egypt was inevitable, as seen in verse 1. Asher accompanied his other brothers on the trip to Egypt. He would have been present when they encountered Joseph in Egypt. Only Benjamin was left behind, though Joseph would summon for him to be brought to Egypt in testing the character of his brothers. Though the Bible has little to say about Asher, Rabbinical Literature and the Jewish Encyclopedia have much to offer on the eighth son of Jacob. According to Sifre, at one point in time Asher was not in good standing with his other brothers. The reason for this revolved around Reuben's transgression with his father's wife Bilhah in Genesis 35:21. It was Asher, according to the Rabbi's, who confronted his brothers with Reuben's transgression. At first, the brothers refused to believe such an accusation, and built up resentment towards Asher for his lies. Asher had no ill will towards Reuben or his other brothers, despite their refusal to believe him. In fact, the Rabbinical literature portrays Asher as striving to reconcile his brothers when arguments arose, specifically over which tribe was to become the priestly tribe. Reuben eventually confessed to his son, and repented from the evil he had done. Asher, in turn, was vindicated by his brothers. In other ancient texts Asher is depicted as a virtuous man. He is depicted as being singleminded and honest. He tended to strive for the well being of others, and the betterment of those around him. His descendants, the Asherites, would become known for their wisdom as well. Detail is given concerning the makeup of Asher's family in Genesis 46:17. "And the sons of Asher; Imnah and Ishvah and Ishvi and Beriah and their sister Serah. And the sons of Beriah; Heber and Malchiel." These are the members of Asher's family which descended into Egypt with Jacob. Interestingly, his daughter Serah is one of only three women mentioned in Genesis 46. The other two were Dinah, the daughter of Jacob who was raped by Shechem, and Joseph's Egyptian wife Asenath, who Joseph had obtained in Egypt. Numbers 1 depicts the first census taken by God of His people after their departure from Egypt. The tribe of Asher is listed in verse 40. "Of the sons of Asher, their genealogical registration by their families, by their fathers' households, according to the number of names, from twenty years old and upward, whoever was able to go out to war, their numbered men, of the tribe of Asher, were 41,500." The second census taken by Moses in Numbers 26 depicts the tribe of Asher as growing significantly in the wilderness. Whereas many of the tribes lost men between the first and second census, the tribe of Asher is seen as increasing its numbers by nearly 12,000 men. "The sons of Asher according to their families: of Imnah, the family of the Imnites; of Ishvi, the family of the Ishvites; of Beriah, the family of the Beriites. Of the sons of Beriah: of Heber, the family of the Heberites; of Malchiel, the family of the Malchielites. And the name of the daughter of Asher was Serah. These are the families of the sons of Asher according to those who were numbered of them, 53,400." The tribe of Asher saw remarkable growth throughout the desert wanderings. In fact, they grew by 11,900 men! Only seven of the twelve tribes of Israel saw growth from the first census to the second census. Of these seven, the tribe of Asher was the second largest growing tribe in Israel. Only the tribe of Manasseh saw more growth, increasing their numbers by a staggering 20,500 men. The blessing of Moses echoes this growth. In his blessing, he emphasized the sons of Asher, signaling Asher's fertility and the growth of the tribe. He compared the tribe of Asher to iron, symbolic of strength, seen in the increase of numbers. He also compared the tribe to bronze, a sign of wealth. As stated above, the tribe of Asher was to grow exceedingly wealthy off its olive oil industry. It is also interesting to note that two of the three tribes encamped under the standard of Dan increased in number despite their difficult assignment as the rear guard. Both the tribes of Dan and Asher saw its numbers increase over the forty year wandering. Dan increased by 1,700 men. In Numbers 34 God gave Moses instructions on how to distribute the land to each of the twelve tribes. Along with Eleazar the priest and Joshua, one man from each of the twelve tribes was to assist Moses in his task of distributing the land. The man from the tribe of Asher is given in verse 27. "And of the tribe of the sons of Asher a leader, Ahihud the son of Shelomi." Other men of the tribe of Asher are listed throughout Scripture as well. 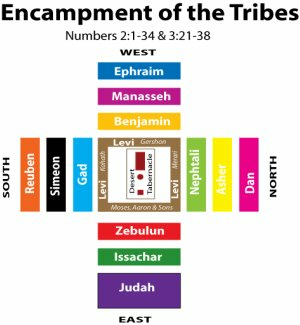 Earlier, in Numbers 7, the leader of the tribe of Asher's army offered up the tribal sacrifice in the wilderness upon the completion of the Tabernacle. The leader of the tribe of Asher was Pagiel. Numbers 7:72 relates Pagiel made the tribe of Asher's sacrifice on the eleventh day. Numbers 13 lists the spies Moses sent out into Canaan. 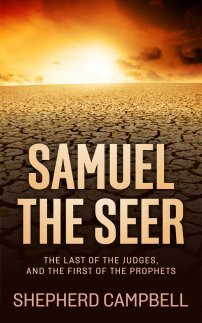 From the tribe of Asher, Sethur the son of Michael was sent to spy out the land. Though Scripture does not mention his name specifically, he would have been one of the tribes bringing back a negative report, and drawing the wrath of Moses for their lack of faith. Only Joshua and Caleb reported back in faith, urging the Israelites to go up and take possession of the land despite the enormous size of its inhabitants and cities. The segment of Israel's history in which the tribes were ruled by Judges was marked by much unrest and war. This time was a very unstable time for the Israelite tribes, one in which they were engaged in numerous battles on multiple fronts. The difficulty of this time period was enhanced by the fact no central government yet existed, and the tribes often strayed from the commands of God, thus found themselves oppressed by foreign kings and rulers. The first mention of the tribe of Asher during the period of the Judges is found in Judges 4. The northern tribes found themselves engaged in a conflict with Jabin, king of Hazor. Jabin "oppressed the sons of Israel severely for twenty years". God, thus, sent a deliverer in the form of Deborah, a prophetess from the hill country of Ephraim. Deborah summoned Barak to lead the Israelite coalition against Jabin. The principal tribes involved were the tribes of Naphtali and Zebulun. The Israelites gathered at Mt. Tabor, while the Canaanite force, which included 900 chariots, assembled at the Kishon river. The two forces collided in the Jezreel Valley, with the Israelite army forcing Sisera, Jabin's commander, to flee on foot. The proximity of the battle to the tribal territory of Asher would lead one to assume the tribe took part in the engagement. However, the Song of Deborah has critical remarks for the Asherites, who choose to instead not to fight. The tribe of Asher, thus, refused to come to the aid of their Israelite brethren, choosing to stay near the shore. This is an interesting allusion to the Asherites being a seafaring people. As touched on briefly above, only two tribes are associated with the sea, with the other being Dan. This may not seem so unlikely when it is taken into consideration that the Asherites were closely tied to the Phoenicians. The Phoenicians were some of the greatest seafarers of the ancient world. They established trade with numerous cultures throughout the Mediterranean, bringing that influence back to Canaan. Asher, with its abundant olive oil supply, would have ventured to the Phoenician markets in order to take full advantage of their bounty. They would have been exposed to the sea more so than any other tribe, due in part to their location along the coast, and their close communion with Phoenicia. Scholars have pointed to this passage as evidence Asher remained aloof and separate from the other tribes of Israel. Though this is certainly the case in this instance, and Asher does seem to be one of the more distant tribes, they did participate in other events and battles involving other tribes of Israel. One such instance of their involvement can be seen in the Midianite oppression of Israel found in Judges 6-7.
again, in the sight of the Lord. For seven years, consequently, the Midianites, along with the Amalekites and the "sons of the East", inflicted Israel. The nature of their oppression is given in Judges 6:3-4. The Midianites would wait until the fields were ready for harvest, and then descend upon them, destroying the food supplies of Israel. These invaders also killed the domesticated animals necessary for agriculture and meat. In this respect, the Midianites were destroying the very fabric of Israelite civilization. They were striking at the heart of Israel's ability to support itself. God instructed Gideon, of the Abiezerite clan and living in Ophrah, to tear down the altar of Baal and cut down the Asherah which stood beside it. Gideon, taking ten of his servants, did this during the night (Jdg. 6:27). The following morning, the men of the city became enraged at the sight of their toppled altar. Scripture then records, in verse 3, that the invading army "crossed over and camped in the valley of Jezreel." Thus we see the tribe of Asher taking part in a national conflict. They answered the call of Gideon and rallied to support their brethren. Through a series of tests the Lord instructed Gideon to give to his army, God chiseled Gideon's forces down to 300 men. What tribe, or tribes, these men belonged to is not given. However, the tribe of Asher was definitely part of this army. This becomes evident in the later stages of the battle. 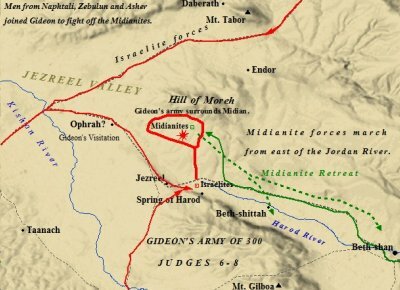 Gideon devised an imaginative and ingenious plan to overcome the Midianite army. He divided his men into three companies (Jdg. 7:16). Each man held in his hand a trumpet and an empty pitcher, with a torch of some kind inside the pitcher. Gideon then encircled the Midianite encampment, staggering his lines to create the illusion many more men were involved than a mere 300. At his instruction, the men smashed their pitchers and blasted their trumpets. With the torch in their left hand, and the trumpet in their right, the Israelite forces must have surely created a sense of shock and awe to the encircled Midianite army. Scripture tells that God "set the sword of one against another even throughout the whole army". The Midianite army fled in confusion and panic. The Israelies pursued them, slaughtering many in the process. The Midianites, along with the two Midian leaders, Oreb and Zeeb, fled the Israelite army. It was at this stage that the presence of Asher becomes clear. The two Midian leaders, Oreb and Zeeb, apparently fled from the battle as the Israelites, under God and Gideon, struck them down. In fact, the whole of the Midianite army fled from the Israelites. Israel, however, pursued after Midian, as related in verse 23. Asher was seemingly one of the lead tribes in this battle. This is evident in the fact they took up arms and pursued the fleeing Midianites. Whatever the cause for their refusal to fight with Deborah, the Asherites were clearly at the front of Gideon's army. Their pursuit paid off in Judges 7:25, as the Israelites caught up to the fleeing Midianite chiefs. Zeeb at the wine press of Zeeb, while they pursued Midian; and brought the heads of Oreb and Zeeb to Gideon from across the Jordan." The tribe of Asher's involvement in this engagement only serves to further muddy the waters in terms of their involvement with the other tribes of Israel. They turned a deaf ear to Deborah's call, only to turn around and fight in Gideon's army, playing a major role in killing the Midianite commanders. They were heavily involved in Phoenician affairs and trade, including involvement in the pagan religious practices, further distancing themselves from Israel. They were extremely wealthy, with beautiful women and men of wisdom, yet their influence on the history of Israel appears minimal. With the unification of Israel under Saul, a new era of Israelite history was launched. The United Monarchy of Israel was to last through the reign of Solomon. The tribe of Asher figure in prominently in both the reigns of David and Saul. This is further evidence they may not have been as aloof and distant as scholars have portrayed them. The tribe's first appearance in Scripture during the time of the United Monarchy occurs in I Chronicles 12:36. David, along with a large contingent of Israelite soldiers, had gathered at Hebron; "to turn the kingdom of Saul to him, according to the word of the Lord.". A number of tribes brought contingents of men and supplies. The tribe of Asher brought a force of 40,000 men to serve in David's army. This was the second largest contingent of men, with the largest belonging to Zebulun, which brought 50,000 men. This does not seem to be indicative of a tribe which is distant and aloof from their countrymen. In fact, this seems to imply just the opposite. Asher was intimately involved in the Israelite affairs. How else might one explain the tribe bringing the second largest contingent of warriors to aid in David's seizure of the throne? Whatever their issue was during the time of Deborah and Barak, all indications in Scripture seem to be that the tribe of Asher participated in other important events afterward. Though their involvement with Phoenicia was sure to have been a source of conflict amongst the other tribes, their support of David was vital. Their contribution to David's army accounted for a full one-third of his total army. King Solomon, David's son and the last king of the United Monarchy, tabbed twelve men of Israel to be his deputies in I Kings 4. These men were Solomon's officials, and were responsible for providing for the king and his household one month out of the year. Verse sixteen lists the official over Asher as Baana, the son of Hushai. Hushai played an important role during the reign of Solomon's father David in II Samuel 15. Hushai agrees to David's request that he go over to Absalom, pretending to serve him. Hushai, in essence, was a spy, and spied on Absalom. Hushai was said to have been "David's friend" in II Samuel 15. Solomon, thus, returned the favor by naming Hushai's son deputy over Asher. Solomon, however, gave twenty cities of Asher to King Hiram in exchange for craftsmen to work on the Temple. This act surely must have angered the Asherites, though Scripture gives no such indication of any response by the tribe of Asher. Yet, upon the dissolution of the United Monarchy with the death of Solomon, Asher choose to side with Jeroboam I.
Jeroboam I broke from the southern tribes of Judah, Simeon and Benjamin to form a Northern Kingdom of Israel. Asher joined the Northern Kingdom of Israel. It would seem the tribe of Asher would have remained with Judah, seeing how they supported David to such a large degree. However, perhaps their alliance with the North was due, in part, to Solomon's decision to give Hiram twenty cities of Asher. Scripture makes no such claim, so the above should be taken as speculation. Asher's geography likely also played a factor in their decision to join the Northern Kingdom. They were located in the north of Canaan, and shared borders with Zebulun, Issachar and Manasseh. Hezekiah (725-697 BC) reigned in the Southern Kingdom of Judah during the tumultuous events of the Assyrian conquest of the Northern Kingdom of Israel. Judah remained free from the Assyrian invasion, surviving nearly two hundred years before succumbing to King Nebuchadnezzar of Babylon in 586 B.C. During the reign of Hezekiah the Passover in Jerusalem was re-instituted. The Temple was cleaned out, altars removed, and messages sent throughout Israel proclaiming the Passover and urging all Israelites to come worship the Lord at the one true Temple. Though the message was laughed at and scorned by a number of Israelites, a few of the tribes of Israel humbled themselves. The tribe of Asher was one of only three tribes mentioned as answering Hezekiah's call. II Chronicles 30:11 records those tribes which choose faithfulness. "Nevertheless, some men of Asher, Manasseh, and Zebulun humbled themselves and came to Jerusalem." Once again these are not the actions of a distant and aloof tribe. Asher seems to have been keenly aware of the circumstances involved in the affairs of Israel. The Northern Kingdom completely fell apart in 723 BC, with a large number of people deported and exiled. Asher, however, seems to have escaped the brunt of the Assyrian deportation. Their presence in Israel is signified by their response to Hezekiah's call. They saw the need for redemption and reconciliation, and humbled themselves before coming to Jerusalem. This was an act of faithfulness on the part of the men of Asher. Despite their association with Phoenicia and Canaanite religion, a portion of Asher still remained true and faithful to God Almighty. As late as Hezekiah the tribe of Asher was still worshiping the God of Abraham , Isaac and Jacob. A fascinating mention of the tribe of Asher is made in the New Testament book of Luke. This instance takes place in Luke 2 and involves a prophetess named Anna. Anna is said to have been the daughter of Phanuel, of the tribe of Asher. Luke 2:36-37 give an account of Anna. "And there was a prophetess, Anna the daughter of Phanuel, of the tribe of Asher. She was advanced in years, having lived with a husband seven years after her marriage, and then as a widow to the age of eighty-four. And she never left the temple, serving night and day with fastings and prayers." It just so happened that on this particular day a couple was bringing their young son to the temple to present him to the Lord, in accordance with the Law of Moses. This child happened to be none other than Jesus, with His earthly parents Mary and Joseph.Anna the prophetess was aware of who Jesus was. She, along with a righteous man named Simeon, recognized Jesus as the Messiah, and exclaimed to all of those around this fact. Verse 38 records Anna's response to the Christ-child. "And at that very moment she came up and began giving thanks to God, and continued to speak of Him to all those who were looking for the redemption of Jerusalem." The tribe of Asher, thus, maintained its identity into the New Testament era. Many of the other tribes had been lost by this time. The Assyrian and Babylonian Exile had weakened Israelite nationhood. The mighty Roman Empire was now in control. Yet, the tribe of Asher is represented by this incredible woman; clear indication they retained their tribal identity. The tribe of Asher is certainly an enigmatic tribe. They are hard to pin down. On one hand, they merged in many respects into Phoenician culture and life. They were chastised by Deborah for their willful refusal to come to the aid of their Israelite brethren. Their abundant supply of olive oil led to a wealth which created a self-sufficiency, unique to the other tribes of Israel. Their association with the sea is further evidence they were different than the other tribes of Israel. Indeed, many scholars of today are quick to point these factors out, and claim that Asher remained distant and separate from the other tribes. Though these things are true, the tribe of Asher also provides one with enough evidence to support the theory they were important members of the tribes of Israel. Both Jacob and Moses had positive and encouraging things to say about Asher. The Asherites supplied oil in times of need to all of the other tribes of Israel. They played a decisive role in Gideon's defeat of the Midianites, killing the two Midianite chiefs. They sent a large number of men to king David in Hebron, in support of his claim to the throne. They are represented in the New Testament by the prophetess Anna in a remarkable incident involving Jesus Christ. The tribe of Asher, though their overall impact on the history of Israel is debatable, cannot be denied they played important roles at critical times throughout the history of Israel. The tribe is mentioned in Revelation 7, the only list of the tribes in the New Testament. In the days leading up to God's judgement, 12,000 men from the tribe of Asher will be sealed with the "seal of the living God" on their foreheads. These sealed individuals, 12,000 from each of the tribes of Israel, are called the "bond-servants of our God". Asher's most glorious moment, therefore, is yet to come.